Anti-Wrinkle Creams – how do they work? Fine lines and wrinkles start to appear on our skin as we age (usually around our late 20’s to early 30’s in Australia due to sun exposure and environmental effects), and continue to develop with age. They start when collagen production starts to slow down. As collagen is the most plentiful protein in our bodies, and provides our skin with elasticity and suppleness, as production slows, lines and wrinkles (and eventually loss of firmness) start to appear. The effect can be seen on the 2 images below. 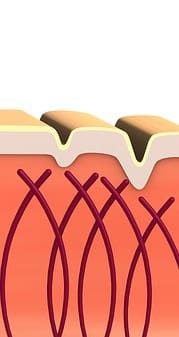 The image on the left shows younger skin with plentiful collagen production, whilst the one on the right shows older skin where collagen production has started to slow, and wrinkles have started to form. Antioxidants: Antioxidants are wonder ingredients. They help your skin defend itself against the onslaught of aggressors in the environment that age our skin and lead to lines and wrinkles. Ingredients such as green tea, coenzyme Q10, vitamins A, C, and E, and retinol are antioxidants. Retinol: Although mentioned above, this ingredient deserves its own section. Retinol is a vitamin A derivative, that increases cell turnover and helps stimulate collagen production. If the product you use contains retinol, make sure you use a sunscreen, as the exfoliation effects may leave your skin more susceptible to sunburn. Hyaluronic Acid: Hyaluronic Acid occurs naturally in your body, and it’s benefit in wrinkle creams lies in the fact that it can hold many (many) times its weight in water, so it attracts water to your skin from the moisturiser, and the atmosphere, leading to greater hydration. Hydroxy Acids: Ingredients like alpha hydroxy acids and beta hydroxy acids (salicylic acid) sweep away the top layer of your skin and help stimulate the growth of new, smoother skin. Again, if the product you use contains hydroxy acids, make sure you use a sunscreen. 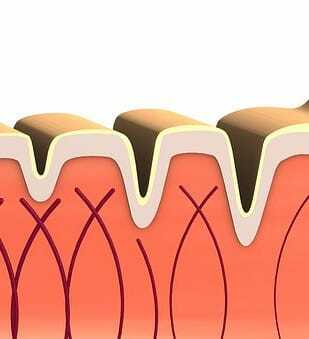 Peptides: Collagen is a protein made up of long segments of amino acids (like a chain). When collagen breaks down, short segments of amino acids are formed, known as peptides.Topical application of peptides helps your skin to stimulate collagen production by tricking it into thinking these peptides are its own collagen broken down, so it needs to produce new collagen! The latest innovation from skincare experts Nivea Cellular Anti-Age Volume Filling Pearls contain collagen boosting Creatine, and a high concentration of Hyaluronic Acid to help visibly minimise fine lines and wrinkles. The pearls dissolve the potent formula with each application, and it instantly absorbs into your skin, leaving it looking fuller, and plumper, and less lined. 30ml RRP $32.99. This is a fabulous product from Australian beauty brand Jurlique. Purely Age-Defying Wrinkle Softening Cream nurtures and helps soften the appearance of fine lines, leaving your skin looking and feeling soft, firm and protected. The lightweight, non-greasy and easily absorbed cream contains power ingredients green tea, grape seed and turmeric to help protect skin against environmental damage. Avocado, shea butter, jojoba and rosehip oils as well as aloe and vitamins A and E moisturise, soothe, hydrate and soften the skin. 40ml RRP $87.00. With the soothing benefits of Avene thermal water, the PhysioLift Day Cream contains Ascofilline™ a high tech ingredient helps maintain collagen, and protects the structre of your skin, Hyaluronic Acid to visibly replump your skin, and retinaldehyde to help smooth the appearance of fine lines and wrinkles. Powerful antioxidants help to protect your skin from external aggressors, leaving it protected and luminous. Suitable for dry and sensitive skins. 30ml RRP $68.95. This powerful product is pack so full of anti-aging goodies, it’s hard to know where to start. Super concentrated doses of pure L-Sodium Hyaluronate Acetyl Octapeptide-3 and a 100% natural skin-tightener make this serum an anti-aging wonder. Fortified with encapsulated multi vitamins and V8 Peptide Complex® this serum helps to relax the muscle and decrease appearance of lines and wrinkles leaving the skin hydrated and radiant. Suitable for all skin types. 30ml RRP $92.00. 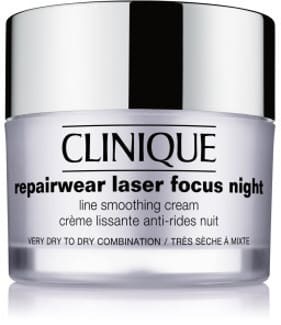 From skincare powerhouse Clinique, Repairwear Laser Focus Night works to help repair your skin as you sleep. Used over time, the peptide and amino acid technology helps to boost natural collagen production, leading to a visible reduction in fine lines and wrinkles, and smoother more supple skin. Available in 2 formulations – for oily to combination skin, and dry combination to very dry skin (pictured). 50ml RRP $92.00. 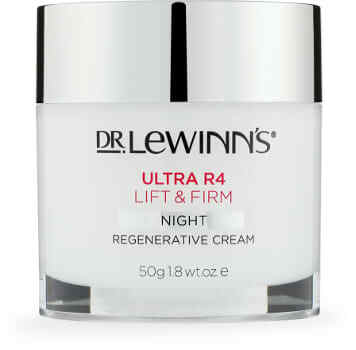 Anti-aging brand Dr. LeWinn’s Ultra R4 Regenerative Night Cream is enriched with pro-collagen and pro-elastin peptides to help visibly diminish the appearance of fine lines and wrinkles. Rosehip oil and Shea Butter, help hydrate your skin and protect it against external aggressors. Haberlea Rhodopensis extract helps reduce the appearance of wrinkles and improves skin texture and moisture levels. Your skin awakes visibly hydrated and renewed. 50g RRP $74.95. Skin firming solutions aren’t just creams and lotions that are applied to your skin. 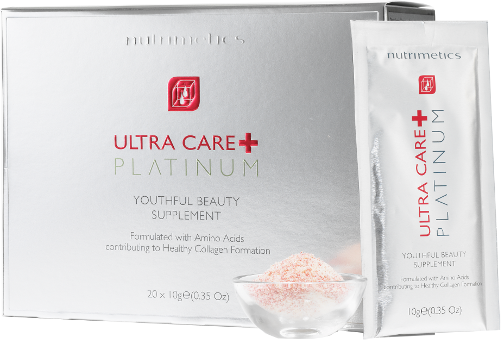 Nutrimetics Ultra Care+ Platinum Youthful Beauty Supplement is formulated with a blend of amino acids, vitamins, minerals, and antioxidants to promote skin well-being from within. That’s right – it is a sachet supplement that you mix with water and drink! It’s pleasant tasting, and easy to drink. Used over time, it helps improves skin elasticity, helps promote the formation of collagen, and protects against free radical damage. Not suitable for children under 15 years or pregnant women. 20 x 10g sachets RRP $79.00.